Yellow Low Density Liners: The X-Seal Significantly Reduces The Seal Area To Minimize Seal Failures. Unique Design Lets Bag Conform To The Container'S Shape, Distributes Weight Of The Refuse Evenly Around The Bag. This Increases Carrying Capacity And Eliminates Leakage Problems. 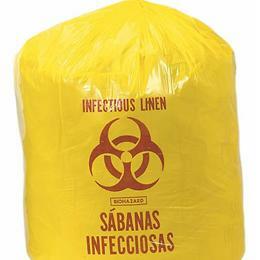 Printed "Infectious Linen" In English And Spanish With The Universal Bio-Hazard Symbol. 31" X 43", 1.1 Mil, 33 Gal.